My 2005 Admiral 38 catamaran Afloat is a 38 foot long, 23 foot beam, owner's version (3 stateroom) beauty. Admiral cats were manufactured in South Africa - I say "were" because production was halted a year or two ago. I understand that the molds have been purchased so that production will hopefully continue; or perhaps it already has recommenced. 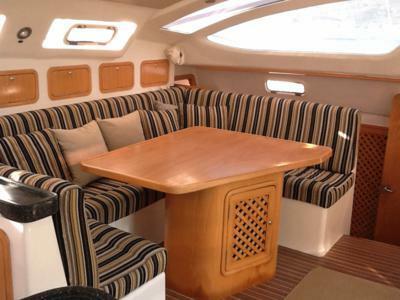 The 2005 Admiral was beautifully appointed in its interior with excellent woodwork and meticulous joinery. 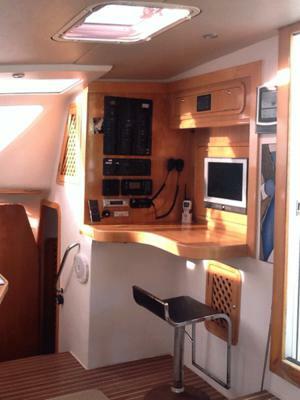 She offers a king sized bed in the master cabin in the starboard hull; a queen size bed and double bed in the two port guest cabins; and two heads with electric toilets. 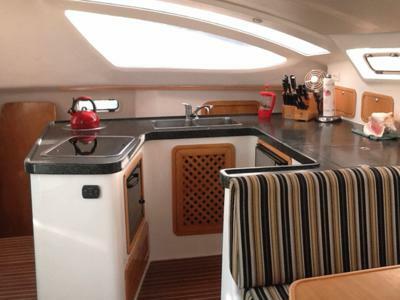 Her galley is the envy of other 38 foot catamarans in terms of its liveaboard spaciousness. She has twin Yanmars (3YM30) which always afford ample power when required and, of course, supreme manouverability in tight spaces. Afloat has proved to be an extremely capable and comfortable blue water vessel. 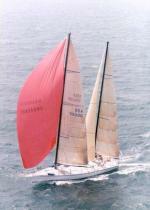 She was sailed easily across the Atlantic from South Africa to the U.S. by the original owner. She then spent almost two continuous years circumnavigating the Caribbean from the U.S. to the Bahamas, down the Leeward and Windward Islands; westward to the islands off Venezuela, Columbia and into Panama and then up through Central America and back to the U.S. I then acquired this dependable catamaran and have sailed her for 5-6 months every winter/spring for the last five years - the first year in the Bahamas and then subsequent years in the Caribbean islands, predominantly between the Virgin Islands and down to Trinidad. The Admiral 38 is a very enjoyable and dependable catamaran that sails easily (I single-hand at least half the time in between family and guest visits). Common to catamarans without dagger boards, she is a typical catamaran in that she will not point comparably to a monohull - but that has never been an issue for the liveaboard luxury of a non-heeling vessel that is also a stable dream at anchorage. I've had years of experience on monohulls and now I NEVER miss the heeling and discomfort both underway and rocking at anchorage associated with a monohull. 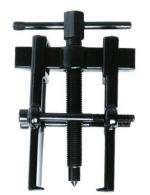 Stability = comfort for long term cruisers aboard a catamaran! And, yes, rather common to catamarans, there is occasional slamming under the bridgedeck, particularly in choppy, confused seas, but again, that is a totally acceptable trade-off to me for the no-heeling and lateral rocking associated with a monohull. And let me emphasize the seaworthiness of my Admiral catamaran. Several cruising seasons ago, while underway on a long passage, I encountered winds that peaked at 58 kts (honestly! )accompanied by violent rain, thunder and lightning. The boat handled those conditions admirably and while there was some minor damage (two slats on the walkway between the tramps came off; my Canadian flag astern was totally shredded; the Sunbrella cover on my jib was in pieces and a jib sheet flew loose as a result of a released knot), the boat got me to a safe and protected anchorage at the end of the trip. I realized that voyage would have been so much more difficult single handing aboard a monohull' It was that trip and experience in that unforgettable storm that cemented my love affair with my Admiral 38! As mentioned, the Admiral is easy to single-hand and in my extensive Caribbean sailing experiences, in the favourable trade winds she readily achieves an 8 knot average cruising speed under sail. 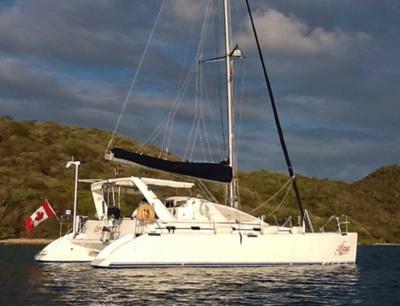 I have had the privilege to enjoy the Admiral 38 AFLOAT in the BVI. What a joy. Last year we chartered a 44foot catamaran. My 5 kids prefer the 38 foot Admiral because they just like it better. Thank you for a lifetime of memories. S/V Plane Sailing --- Admiral 38 executive catamaran. May 2003 my wife and myself then aged 68 years without any previous sailing experience sailed from Cape Town aboard our brand new Admiral 38 catamaran to circumnavigate the world. We have since sailed continuously living aboard Plane Sailing which has performed magnificently the whole of this time. From time to time we have encountered appaling weather conditions ie 300nm off-shore Brisbane, winds 85kts and 9.5m waves causing no damage and no grave concern for our safety. This weather prevailed for 3 days. Our Admiral 38 executive has proven to be an exceptionally safe, comfortable and dependable Blue Water Cruiser. Deirdre and I owe many votes of thanks to the designer Angelo Lavranos and David Bird the SA boat builder. We continue to sail presently in Asian Waters having covered many many thousands of nautical miles over the last 12 years. Just thought I would mention that the Admiral 38 and the Admiral 40's are being built by us, Celtic Yachts, in Cape Town South Africa. We have made several improvements, and will continue to do so! I concur that marina/docking charges for catamarans present a financial crunch when compared to fees for a similar length monohull. While I rarely dock at marinas in the Caribbean, given the abundance of anchorage opportunities and my preference to avoid the compact quarters of marina berths anyway, the cost to do so is 1.5X or double the monohull rate. Another factor to consider with catamarans comes into play when hauling the boat. My cat has a 23' beam and many yards do not have a travel lift theft can accommodate that width. And those that do charge more for use of the larger lift. For all the other benefits of comfort and stability for long term cruising on a cat, I readily accept the additional costs for marina dockage and travel lifts. Thanks Terry, you make a compelling argument in favour of catamarans for cruising and living aboard.